I would like to see a discussion on the appropriate form and amount and distribution of flotation or buoyancy for small recreational boats – dinghies and such. Internet forum discussions seem to favor ‘too much” in my (not so) humble opinion. I’ll posts some thoughts on this issue over the next few days. The photo heading this thread shows Ben Fuller’s Harrier, Ran Tan pulled up at a float after a sail. The flotation bags are visible under the stern sheets. Smaller bags run down each side under the narrow side benches and a v-bag is up forward. I much prefer going this route to building in flotation tanks. There is nothing blocking access to the hull structure. No added weight or the added fuss of making, sealing, painting a set of tanks. Tanks are rigid. That can be good in some boats where there are large flat panels in the hull. Say a flat-bottom or vee-bottom craft. Here, the hull is plenty strong without them. Besides access and ease of construction these bags are easily removed. They can also be deflated. For instance, on a long expedition, we might deflate the side bags and tie in dry-bags filled with gear and provisions in their place. As these bags are emptied and lose volume, the additional buoyancy can be restored by re-inflating the flotation bags. As to the volume required, the key thing to consider is how much buoyancy do we need to get, not just the rails, but the dagger/centerboard cap’s slot out of the water while swamped. We need enough buoyancy, at 64 lbs-per-cubic-foot (salt water), to counter the weight of the boat – rig and all – and whatever gear and possibly ballast is aboard. 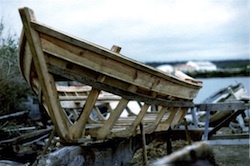 The beauty of a wooden hull is that its structure is at least buoyancy neutral. Any other questions or thoughts on the matter? I’d endorse your thoughts in this application – with the observation that the restraining and fixing of the bags might be critical! on its side in breaking seas there would be tremendous wrenching / tugging. in general I favour end tank flotation – and reserve side tanks only for racing where fit agile crews and rescue backup minimise the hazards of turtling and having the ‘high riding’ boat blow away! boxing in under the thwarts seems to work. “surging” or slopping of the water from side to side (after recovery) has been a concern mentioned – but I can’t remember if I ever found it so. lateral stability I seem to remember as being easy to manage? Yes, the bags need to be secured properly. These are English and come with straps and anchors. Too much flotation can be a problem! As you suggest. Also making it more difficult to right the boat too. Just enough keeps the boat low in the water, easy to climb back in. You actually float inside the swamped hull until you’ve bailed some water. Be Fuller did a capsize recovery demo with Ran Tan a few years back. Surging can be a problem. Not only in its effects on stability. If the surge of water can get trapped under structure, say a foredeck or a seat, it creates a hydraulic ram. This can quickly tear a boat apart! Handholds on a skeg or bilge-keels is a good idea on a boat that’s likely to spend time turned over. Except for a racer. Those holes create tremendous drag for their size. Just a quick question – can the drag of the handholds be quantified in practical terms? – like how many minutes (or hours!?) later at the campsite after a day’s sailing? I would suspect it might well be outweighed by other factors – not least peace of mind for some! Wouldn’t it be less than if the wood cut from the hole were fixed to the skeg of another boat? Btw – you know those grab rails fixed to the bottom of dinghies carried on thecabintop of cruising yachts? – well my mate put an extra two for a total of four! “for strength”. Yes it was slow – but three people and generous amounts of cruising gear in an RNSA 14’er made it barge-like anyway. What happens when the flow leaks through holes like this is that you lose high pressure on the windward side of the skeg and the turbulence causes a big bubble of disturbed water that destroys good flow aft of the hole. As to how to quantify it? I’d rather look at it in terms of qualities. Being faster and more weatherly can mean the difference between catching a tide and losing it. Between beating a storm in and getting clobbered. That sort of thing. Often in beach cruising, gunk-holing – as is also true in racing – getting a favorable break because you can be a bit faster or more weatherly can then effect the whole day. Think of it as making windows of opportunity. These are “security” issues just as much as strength or being able to hold on. If we can glide past trouble we don’t need to survive the worst hardship. Another point with these, or any kind of rub-strip or skegs or bilge-keels, it’s important that they be positioned parallel to the centerline. 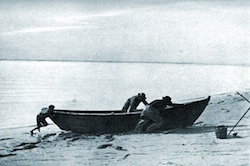 If they toe-in or out, or are curved in plan view – they must necessarily curve in profile to follow the curve of the hull – they will cause drag and spoil lift and flow. Yet, we often fail to take a boat’s foils seriously. It’s not just weed and barnacles on the bottom that make a boat sluggish. No boat will point worth a damn if its foils: centerboard, keel, or rudder are rough. And by rough I’d like to say that anything shy of a full mirror polish is not ideal! Of course that’s often not possible; but it’s important to know when we’re “sinning” and what we’re losing when we do! Holes and lines or wires under water cause a lot of drag for their size! Skegs and bilge-keels need to be straight in plan view! Foils need to be clean and as smooth as we can get them!